Accommodation consists of 14 “bures”, traditional two-room, thatched cottages built by Fijian craftsmen. Each grand bure includes wood floors, a four-poster king-size bed, a large indoor jetted spa, a verandah with a queen-size day bed, a walk-in double shower, double vanity, handcrafted hardwood furniture, a wet bar including ice maker and a Bose CD player. The luxurious Turtle Island Resort is a 500 acre tropical paradise located in a remote area of the Yasawas in Fiji. It is situated within a community of 7 villages, on 3 separate islands with approximately 3500 inhabitants. Turtle Island offers 14 shimmering white sand beaches dotted with a collection of traditional Fijian style thatched bures, which each include two spacious rooms with two baths and a vaulted ceiling. After Richard Evanson purchased the uninhabited island of Nanuva Levu in 1972 he made a commitment to restore it to its original state, resulting in Turtle Island becoming an environmentally friendly and culturally sustainable high quality tourist operation. Guests on Turtle Island can participate in a number of different traditional Fijian ceremonies, thereby understanding the living culture which permeates the Turtle Island experience. Turtle Island’s friendly staff of more than 100 Fijians takes care of guests' every need, including assistance with activities such as snorkeling, scuba diving, windsurfing, boating, deep-sea fishing and horseback riding through the island's 500 acres. All meals and beverages are included and every night there is a dinner party held at different locations around the island. Currently, the world famous luxury resort caters to couples exclusively, except for a few designated "family weeks" each year. Turtle Island can also be hired out privately for weddings or company meetings. 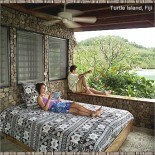 When you hire out Turtle Island you are guaranteed an unparallelled level of service and privacy. Please enquire for rates. Rates cover all meals including a la carte breakfasts, sumptuous buffet lunches or private champagne & lobster picnics on a private beach, afternoon snacks, pre-dinner savouries and gourmet dinners. All beverages including fine wines, spirits, and French champagnes and all activities including deep sea fishing, scuba diving, excursions to a Fijian village on a neighboring island, horseback riding on the beach, mountain biking, sunset cruise, sailing, kayaking, snorkeling, windsurfing, and use of all sporting equipment are also included.